Or a tale about Winter’s tail! 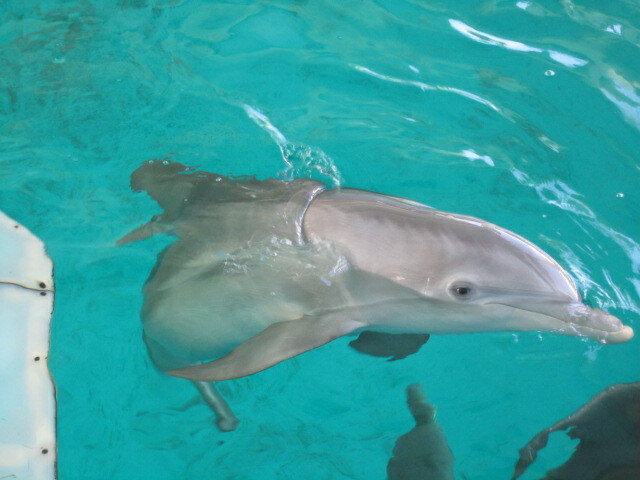 You might be familiar with the 2011 movie called “Dolphin Tale”, and from there have learned of a very special dolphin housed at the Clearwater Aquarium in Florida. 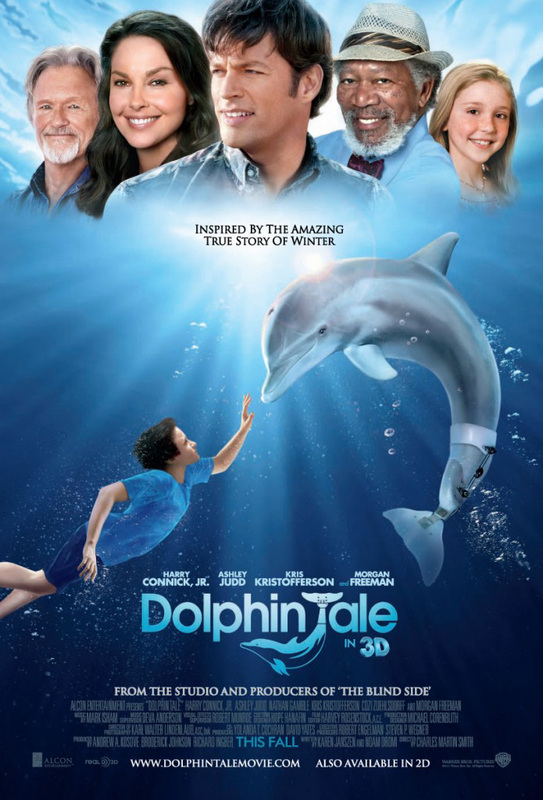 *blowing Harry a kiss* Anyway, while the account in the movie is fictionalized, the dolphin Winter and her fate are not. 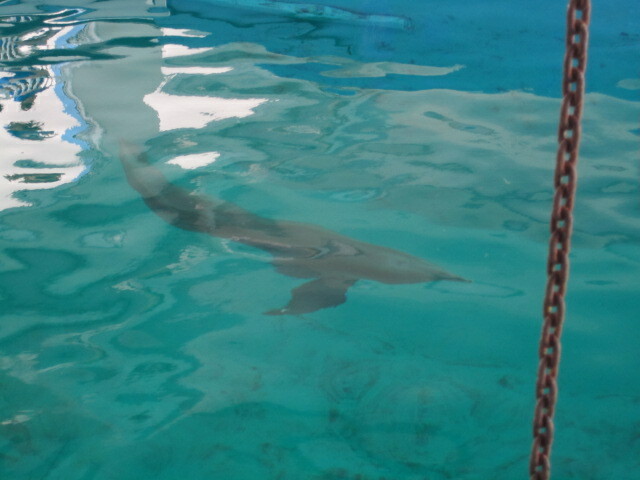 In December 2005, a young dolphin was discovered by a fisherman in Mosquito Lagoon, seriously injured from tangling (literally) with a crab trap. 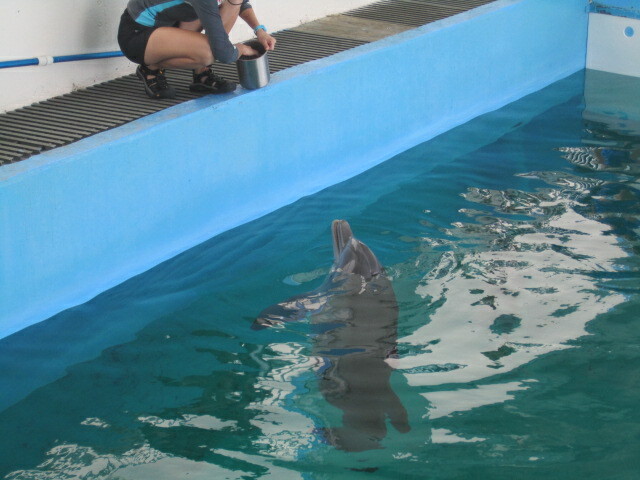 She was subsequently transported to the Clearwater Aquarium for care, though the prognosis was not hopeful. While in the movie the medical staff (Harry) amputates her tail due to infection and death of the tissue, in real life, as the tissue died, the tail sloughed off by itself. The challenge was the same in either case. 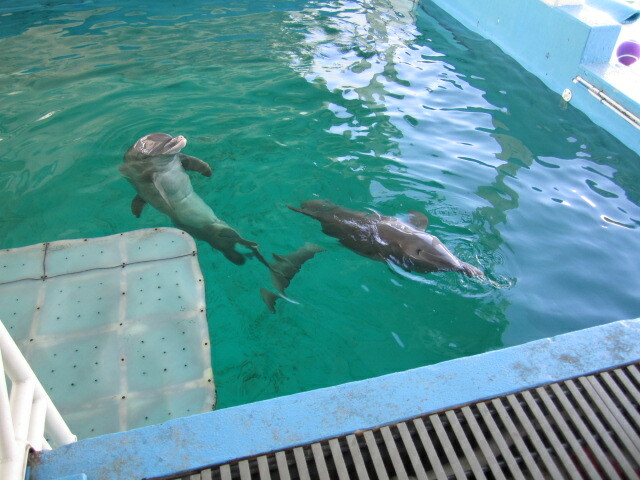 In the movie, Winter discovers how to move about on her own, swishing her back end from side to side, fish-like; in reality, a trainer told me they had to teach her to do so. The next challenge that resulted was also the same as in the movie – the side-to-side motion was compromising the health of her spine. Without the strength and stability which flapping her tail up and down (dolphin-style) would have given her, she was developing a curvature and deformity of musculature that would ultimately disable her to a potentially fatal extent. This is what brought about the need for a prosthetic… a temporary restoration of a tail that would allow her to swim as she was designed to, thus sparing her spine from further damage. It pretty much looks just like what you see in the movie graphic above, and I had the opportunity to slide my arm into the sleeve of one of her prosthetics. It was amazingly soft, and clingy and almost cloud-like. The movie correctly stated that they had to design a gel for the sleeve for her specifically, called Winters Gel. This amazing design was accomplished by Hanger Prosthetics and Orthotics (not Morgan Freeman LOL), who have actually manufactured 18 of these devices for Winter! She was a young and still growing girl when rescued, so has outgrown or worn out a few of them. Previous models are used for tactile exhibits and also displayed at the affiliated museum which is dedicated to the movie. The point of the prosthetic is not to rehabilitate her to ocean life; that will never happen. Even if she were whole, she was separated from her mother too early in life to have learned the necessary life skills. What her special tail DOES do is function as her physical therapy. She wears it about 30 to 60 minutes a day, working out with the typical dolphin tail motion to keep her spine as straight as possible. 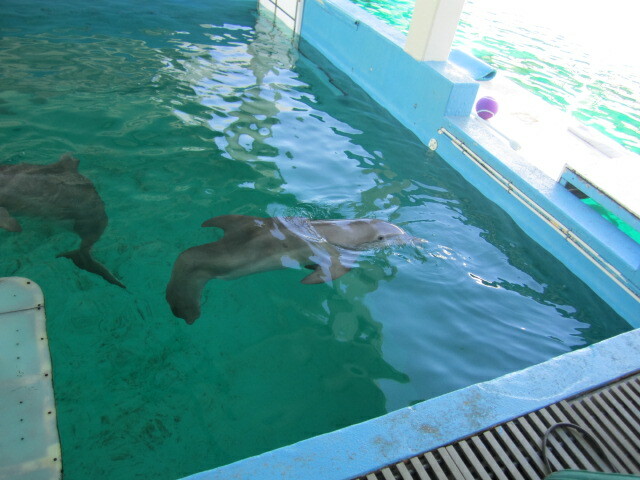 Additionally, they work with her manually (when the tail is off), directing her to submerge nose down, while lifting her up slightly out of the water by her back end… a sort of gentle traction. She is a smart, special and happy girl with a great life, thanks to the dedication and creativity of an awful lot of people. It's a little harder for her to float erectly; I noticed she leaned quite a bit when vertical. But for treats, you sit pretty LOL! Winter and Panama. Panama was also featured in the movie, and is deaf. 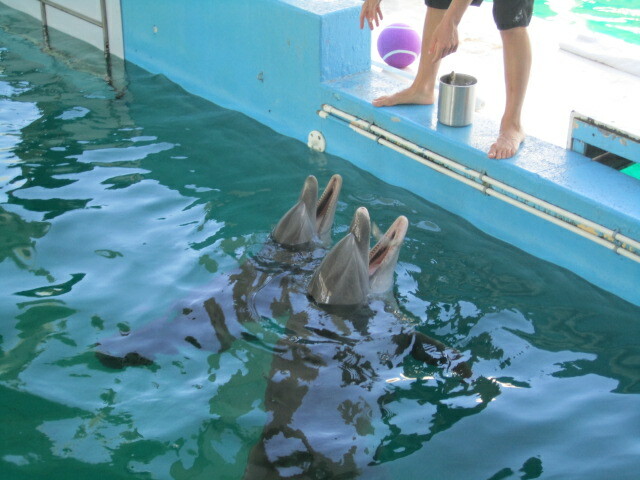 With dolphins' reliance on echolocation, this placed her at a serious disadvantage. She also has a home for life a the aquarium. She responds excellently to signed commands. I have some more photos from elsewhere at the aquarium, but this post is quite long enough! So much to share about these beautiful animals. She is very pretty, and she’s soooooo soft! I so wish I could have pet her! There was only a narrow window of people allowed direct contact, and I wasn’t able to get there before those stupid kids barged in LOL! Don’t you just hate that? I almost cried when the kiddos wouldn’t give me space to pet the rays at Monterey Bay Aquarium.